Definition at line 55 of file CFG.h. Definition at line 57 of file CFG.h. Definition at line 86 of file CFG.h. Convert to the specified CFGElement type, asserting that this CFGElement is of the desired type. 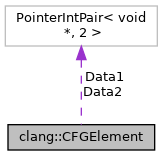 Definition at line 98 of file CFG.h. Referenced by CheckFallThrough(), clang::ento::CoreEngine::enqueueStmtNode(), getLocationForCaller(), clang::ento::ExprEngine::processCFGElement(), clang::ento::ExprEngine::ProcessImplicitDtor(), clang::consumed::ConsumedAnalyzer::run(), clang::ento::ExprEngine::VisitLogicalExpr(), clang::threadSafety::CFGWalker::walk(), and writeShouldKill(). Convert to the specified CFGElement type, returning None if this CFGElement is not of the desired type. Definition at line 109 of file CFG.h. 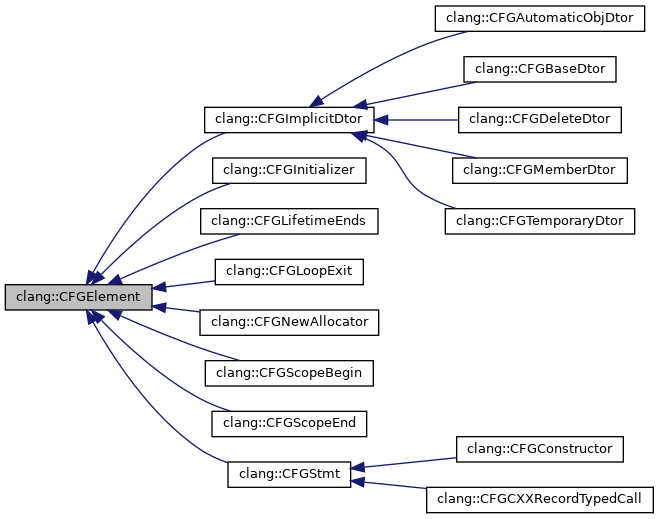 Referenced by Accumulate(), clang::ento::ExprEngine::bindReturnValue(), CheckFallThrough(), clang::ento::PathDiagnosticLocation::create(), clang::ento::CoreEngine::ExecuteWorkListWithInitialState(), clang::CallEventManager::getCaller(), neverReturns(), print_elem(), ResolveCondition(), clang::ento::ExprEngine::VisitCXXConstructExpr(), and writeShouldKill(). Definition at line 118 of file CFG.h. Referenced by CFGElement(), getLocationForCaller(), clang::ento::ExprEngine::processCFGElement(), and clang::ento::ExprEngine::ProcessImplicitDtor(). Definition at line 83 of file CFG.h. Referenced by clang::CFGNewAllocator::getAllocatorExpr(), clang::CFGBaseDtor::getBaseSpecifier(), clang::CFGTemporaryDtor::getBindTemporaryExpr(), clang::CFGDeleteDtor::getCXXRecordDecl(), clang::CFGMemberDtor::getFieldDecl(), clang::CFGInitializer::getInitializer(), clang::CFGLoopExit::getLoopStmt(), clang::CFGStmt::getStmt(), clang::CFGLifetimeEnds::getVarDecl(), clang::CFGScopeBegin::getVarDecl(), clang::CFGScopeEnd::getVarDecl(), and clang::CFGAutomaticObjDtor::getVarDecl(). Definition at line 84 of file CFG.h. Referenced by clang::CFGConstructor::CFGConstructor(), clang::CFGCXXRecordTypedCall::CFGCXXRecordTypedCall(), clang::CFGConstructor::getConstructionContext(), clang::CFGCXXRecordTypedCall::getConstructionContext(), clang::CFGDeleteDtor::getDeleteExpr(), clang::CFGLifetimeEnds::getTriggerStmt(), clang::CFGScopeBegin::getTriggerStmt(), clang::CFGScopeEnd::getTriggerStmt(), and clang::CFGAutomaticObjDtor::getTriggerStmt().